There are two different types of frenums in the mouth: the labial frenum and the lingual frenum. The frenum is a muscular attachment that is found between tissue that may be too tight, resulting in the inability to smile properly. The procedure is done quickly and easily in our office and has very little healing time once it is finished. A frenectomy involves removing the frenum in one or more areas of the mouth. This muscular connective tissue can be too tight or thick, causing a lot of cosmetic issues concerning your smile. Because of the ease of the procedure, you will find that the benefits of having the frenectomy done outweigh the surgery itself. The procedure typically lasts anywhere from 15-25 minutes and is done right in the office. 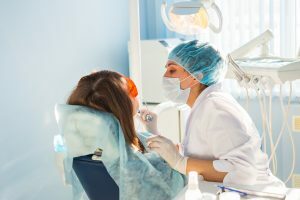 The dentist will use a scalpel, or a laser made to specifically cut through soft tissue to release the tension of the connecting tissue and the muscle. Often, there is very little post-operative pain and swelling, and the patient now has more normal function of the mouth, lips, and tongue. Medication is given if needed, and a follow up appointment will occur to check on the site. Who is a Good Candidate for a Frenectomy? If you want to inquire more about a frenectomy, contact us today and one of our helpful staff members will be happy to assist you.